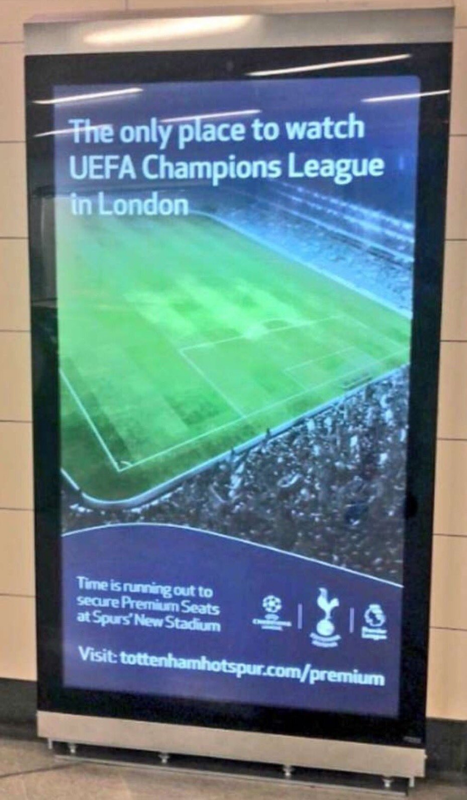 Tottenham have fallen foul of the Advertising Standards Agency (ASA) over posters advertising the Champions League that were seen dotted across the London Underground. The posters in question boast that the club’s new White Hart Lane stadium would be the only place in London that football fans would be able to watch Champions League football. The adverts, which were commissioned several months ago, were intended as a light dig at cross-city rivals Arsenal and Chelsea, both of whom are competing in the Europa League this season. Ironically, images of said adverts first circulated on social media in the aftermath of Spurs’ defeat against Inter Milan, a result which left them on the brink of elimination. Doubly ironic was the fact that Spurs looked like being knocked out of the competition before their new stadium was even open. A comeback win over PSV earlier this week restored hope that Mauricio Pochettino’s side can still squeeze through into the knockouts and, perhaps more importantly, keep their advertising slogan viable for the time being. However, that hasn’t stopped somebody out there from reporting Spurs to the ASA, who have since contacted the club to voice their concerns. According to the Daily Mail, the agency are investigating a specific complaint that suggested the advert was “false because the new £850million stadium won’t be completed until at least January”. We concluded that the ad was likely to have breached the Advertising Rules that we apply and we have taken steps to address this. We have explained your concerns to the advertiser and provided guidance to them on the areas that require attention, together with advice on how to ensure that their advertising complies with the Codes. Either way, it will likely always be a tragedy. Poor Spurs.